Music streaming services have captured the music industry much faster than any other musical phenomenon. The key reason for this is that they're handy and convenient. Convenience, nowadays, is what makes a product appealing. You no longer need to buy separate tapes or CDs, but pay for a subscription and enjoy millions of songs right away. The big bosses of the industry are Apple Music and Spotify with 30 million song collections and millions of users worldwide. If they have similar catalogs, why some prefer Spotify and other Apple Music? Well, because as with many other things, tastes can differ. However, what both Spotify and Apple Music have in common is that nobody expected them to rise that great within such a short period. And nobody expects a new player to come to the market. You should expect though, and today I'm going to compare Apple Music, Spotify and another service, slightly different, but still able to create competition to the market. And we're starting our Apple Music vs. Spotify vs. VOX Cloud comparison. The name itself already hints that your music experience will be like with other Apple products. Unobtrusive, simple and complicated at the same time. That's Apple Music. The service is a part of the Music app, which is a default audio player for iOS devices. Having a subscription, you get access to over 30 million songs and Beats 1 (Apple's radio). Although Apple Music was launched in 2015, it quickly gained its audience and is constantly adding new artists to its catalog. So what is it all about? The service is really impressive as you can find most artists you've heard of. When you search for an artist, you will find everything they've ever recorded, including rare EPs, Deluxe Editions, and collaborations with other artists. That's how much of free trial you get when you subscribe to the service. It's pretty much enough to decide whether you want to keep on using it or not. And it saves you $30. It's very easy to get how it worksю You just search, listen, add to favorites, that's it. The interface doesn't stand in your way when you just want to listen to music. The app includes five tabs: Library, For You, Browse, Radio, and Search. As well as Apple Music's strength, it's its greatest flaw. Although the predominant color is white, huge letters take up most of your screen's space leaving little for the music content. Moreover, if you have a 4-inch or less screen, you need to swipe all the time. Unfortunately, the interface is as easy and overwhelmingly confusing. Apple Music provides over 30 million songs, which is sort of the same as Spotify, but it doesn't include the entire iTunes library, so don't be surprised when you can't find some famous artist, like Tool. Apple Music is currently available for iOS, macOS, tvOS, watchOS, Windows, and Android. You can't access the Apple's collection on PS3, PS4, with Sonos speakers and many other devices. Unfortunately, Apple Music has very poor playlists, and those created by users are unavailable unless they send you a direct link. The main problem of most music streamers is the quality of audio which rarely exceeds 320 kbps. Apple streams at 256 kbps AAC on WiFi and 128 kbps AAC on cellular data. According to lots of surveys, Spotify remains the most popular music streaming service by the number of users. It has some reasoning since overall performance and music catalog can satisfy average listeners who just want some music to listen to. The service has been out for almost a decade, they made lots of improvements and know how to make users happy. Let's take a closer look at Spotify. As soon as you have about 20 songs in your Library, you are offered playlists based on your tastes. And not only one playlist. As your library grows, it includes more and more songs of different genres, so you can expect to see up to 6 Daily Mixes. It's a great way to start exploring new music because these Mixes often include something from your library along with something new that might be to your liking. The one thing that Spotify totally nailed. Both desktop and mobile apps are easy to navigate in without anything confusing or puzzling. The artwork doesn't take all the screen space, the colors aren't acid, and everything's just fine. Where Apple Music failed, Spotify excelled. 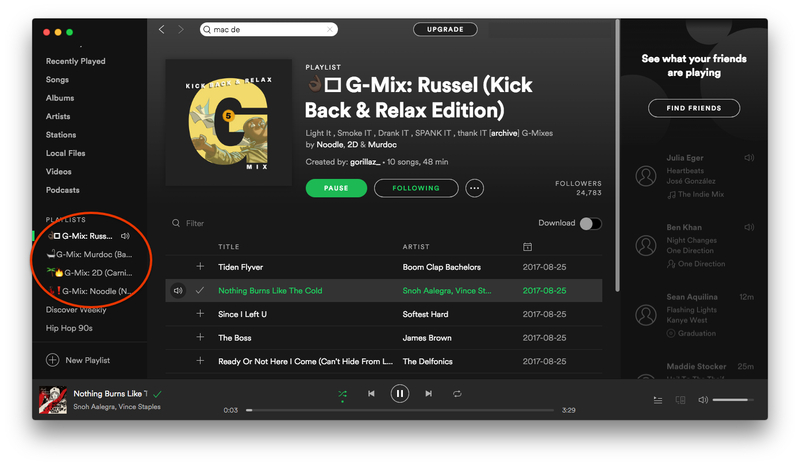 Not only can you find a playlist on absolutely any occasion, but also you can create your own, or follow your favorite artist's playlist, which they usually refresh. I follow all the digital Gorillaz, and Noodles has already significantly contributed to my personal library. It's a great feature that allows you to play music on different devices. The list is too long to outline, but it includes PS3, PS4, Sonos, Amazon Echo, Google Chromecast, JBL, and others. Like Apple Music, Spotify streams at 256 kbps OGG. However, Spotify offers a Hi-Res tier for extra $10, but Spotify﻿ is not quality you want, even Spotify Hi-Res. Spotify, although popular, is available in only some European countries, Australia, New Zealand, few Asian countries and the Americas. Even if you're traveling in a country that's not on the list, you won't be able to listen to Spotify. When you add music to your playlist, you can't change the position of your tracks in this list. This is very sad especially if you like to listen to tracks that create a story like Pink Floyd's songs. Providing you have a free tier, you will constantly be stricken with annoying ads and not one at a time, but up to five and you will only be able to listen to music when you close all of them. Another nasty kind of ads is the audio message which encourages you to buy a premium subscription. It wouldn't be a big deal, yet when you catch the vibe, this ad is the last thing you want to hear. VOX Cloud (formerly LOOP Unlimited Music Cloud Storage) is a cloud storage designed to store your music regardless of its size or format. To access VOX Cloud, you need to have VOX Music Player for Mac & iPhone, which is by far the best audio player for iOS and Mac I've used. VOX Cloud isn't like Spotify or Apple Music because you listen only to your music and the quality isn't limited to 320 kbps. You first download VOX Music Player for Mac & iPhone. Then you sign up for VOX account and get Premium. After that, you can upload your music to the cloud to listen to it both on Mac and iPhone. 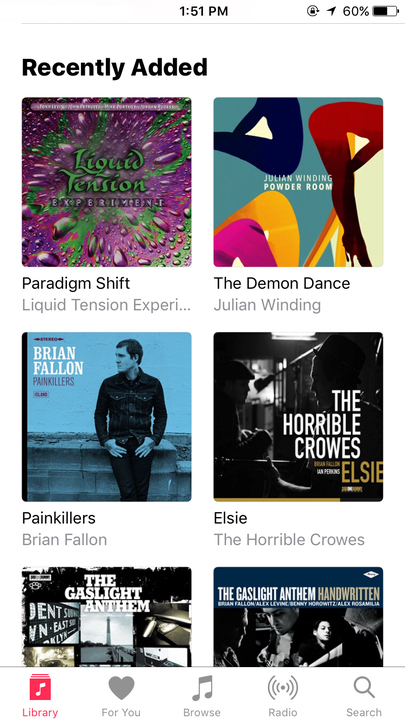 It's one of few ways to enjoy Hi-Res music on iPhone. That's true. Regardless of how big your music collection is, VOX Cloud can store all your songs. You no longer need to bother yourself with buying extra 5 GB on Dropbox or consider converting Hi-Res music to lossy formats to make files smaller. The time of High-resolution is here, and if five years ago MP3 was a predominant audio format, now it's an outsider surpassed by vinyl rips and Hi-Res Digital formats. Since VOX Cloud is an online music storage, your music is available on all devices connected to your VOX account. And the best part is that you can connect as many devices as you want. It makes VOX one of few legal ways to play Hi-Res on iPhone. It's obvious that there are times when you want to discover something new, or are tired of your old music. In VOX Music Player you can log into Spotify and SoundCloud to listen to their music collections without switching between the apps. If you like something, you can add it to your Playlist, and it will always be available on your Mac and iPhone. Also, Last.fm integration helps you keep your listening stats up-to-date. VOX works as other streaming services with either Wi-Fi or cellular data. However, there are often moments when we have neither, and for these exact times, you can download some tracks or albums in advance to listen to them offline later. VOX online radio is another great feature that unlocks over 30,000+ stations including the hype ones like KEXP, BBC Radio 1 or Ibiza Global Radio alongside some local and underground ones. Unlike most streaming services, VOX services are available worldwide. It's a great plus providing you like traveling or live on some tiny remote island in the middle of nowhere. A Christmas gift for audiophiles and music lovers. Now you can set up the sound so that it fits your personal music preferences. Use the Equalizer to adjust frequencies, and turn on BS2B for more detailed sound through headphones. It's a bit old-school activity, but it's still such a pleasure to see how your music collection grows by albums, how your iPhone gets stuffed with thousands of songs that don't even take up space. You can upload music by dragging it to VOX for Mac or using VOX account website. I've used different streaming services, and the sad truth is that most of them are sort of the same. What's killing me is the quality, as I do appreciate the work of artists and want their songs to sound neat and precise. The only tool that can give me such quality is VOX + VOX Premium, and it's my personal choice. I suggest you try it, at least to get some new experience, and don't forget to connect VOX to SoundCloud to browse for something new. Quantity over quality: Should we convert FLAC to MP3?